International Peacemaker Jerome Bizimana of Rwanda is visiting our Presbytery Sept. 27 through Oct. 1, bringing words of hope and reconciliation where the deepest hurts once divided. Invite him to your church! Contact Lisa Ross Thedens at lrossthedens@gmail.com or 319-938-8807. Our Presbytery’s Peacemaking Task Force will assist you in transporting him to your church and do all we can to facilitate your event. Rev. Bizimana Nkumbuyinka Jerome is President of Remera Presbytery in Rwanda and the initiator of the Light Group, bringing together survivors and perpetrators of the 1994 genocide of Tutsi Rwandans. He will share how the church helps bring about reconciliation. Rev. Bizimana Nk. 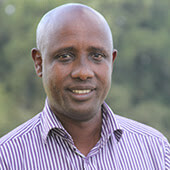 Jerome studied Peace Building and Conflict Resolution in Zambia in 2004 – 2005 at Mindolo Ecumenical Foundation. He is married to Jannette and father of 6 children, 3 boys and 3 girls.